Regular Stylesheets, Table Stylesheets, or Local Formatting? 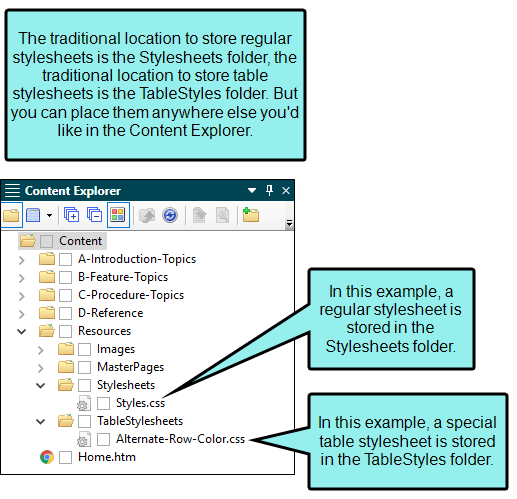 Regular Stylesheet This lets you store styles for general content in your project, including tables, to control how that content looks. See About Regular Stylesheets, Editing Styles in a Regular Stylesheet, and Editing Table Styles in Regular Stylesheets. Table Stylesheet This lets you control the look for tables only, creating customizable patterns. See About Table Stylesheets and Editing Table Stylesheets. Table Properties Dialog This lets you control the look for a specific table only, by setting options locally. See Editing Table Properties. Other Local Formatting Tools For virtually any kind of content that you add to a content file (e.g., topic, snippet), there are a variety of local formatting tools to control the look. For example, you can highlight text in a table and use the Home ribbon to change the color. See Local Formatting. Using a stylesheet is always preferred over local formatting (i.e., controlling the look of content only at the place where it has been inserted). The good thing about stylesheets is that they let you separate the presentation from the content. That way, you can manage the look from one place, which can save you a lot of time and effort. For example, you can change the padding in 84 tables by changing a setting in a single stylesheet, as opposed to opening each of those 84 tables and changing the padding in each one. Of course, there may be times when you need to make a change in the properties for a single table only, but for the most part, you should try to use stylesheets. So why are there two kinds of stylesheets for tables? Why do you need to use a table stylesheet when you've already got a regular stylesheet? You actually do not need to. You can produce a look for tables entirely by using a regular stylesheet. But if you want to create many different table designs, and tables that have different patterns (e.g., every other row might have a green background), it can be very difficult to do this in a regular stylesheet. So Flare lets you use these special table stylesheets to accomplish this task much more easily. You might even use both types of stylesheets to control different aspects of your tables. what about conflicts and precedence? Because you can often control the look of a table in multiple ways—(1) local formatting tools, (2) local table properties, (3) a table stylesheet, or (4) a regular stylesheet—it's possible that you might encounter conflicting settings from time to time. When this happens, the settings closest to the content typically has precedence. 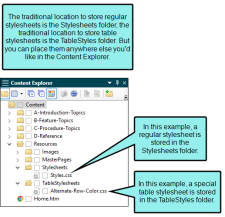 So any explicit setting in the Table Properties dialog (or other local formatting) has precedence over both stylesheet options, and the table stylesheet setting has precedence over the regular stylesheet setting. Let's say you open a regular stylesheet and specify that the outer borders of the table should be green. Then you open the table stylesheet and specify that the outer borders should be red. And then you open the Table Properties dialog and specify that the outer borders should be blue. You've told Flare to do three different things to the same table. So in this case, the table would display blue borders, because the local properties rule over the other settings. But if you remove that setting from the Table Properties dialog and use the default setting, the table would then display red borders, because the table stylesheet has precedence over the regular stylesheet. And finally, if you remove the settings from both the Table Properties dialog and table stylesheet, using the default setting in both, the table would take its command from the regular stylesheet and display green borders.